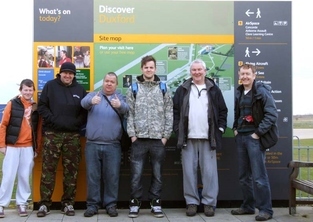 Well as planned Saturday 16th March saw a group of us head off down to the Imperial War Museum - Duxford. It was an early start for all with the first pick-up being 6.15 and even earlier for the taxi driver! With all on board Richards bus we headed off down to make it for opening time as planed, but not before we raided the most unfortunate Macky D's for an entire supply of coffee stirrers for the all essential modelling supplies on route! Weather was good, with some rain and a very strong wind however did not spoil the day even having a freak heavy snow storm on way home! As expected there was an amazing collection on display including exhibits from the IWM London collection whilst it is closed for refurbishment. Without a shadow of doubt we all truly enjoyed it and looking forward to hopefully planning a further visit the end of the year to catch a little more out of season as word has it even more is in the hangers to observe! As it will take time to sort through and upload all photos click on the following links to view the albums stored on an external site.